Last Saturday a small but enthusiastic field to take on the mighty goulburn river for 3 races over the day was to find the overall Goulburn Classic winners. 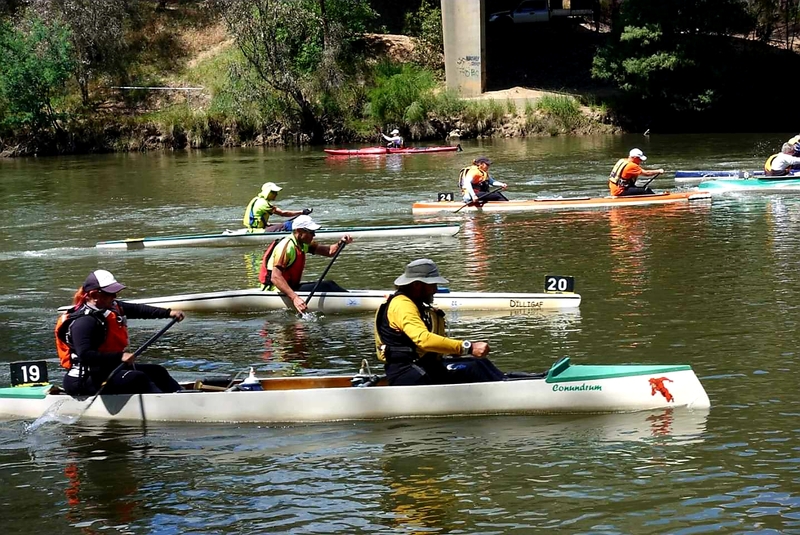 The Goulburn Classic is Australia’s oldest canoe race. It was originally 100 miles non-stop with heroic stories of paddlers negotiating the fast flowing river at night. Now it is a 3 stage race to highlight the beauty of the Goulburn River. The yellow jersey was awarded at the end of each stage. This year it attracted 41 paddlers in k2s, tk2s, skis, canoes ,k1s, dr boats, and sea kayaks. Stage 1 was from Keresdale to Trawool Bridge (10km) followed by morning tea and the awarding of the yellow jersey. The Mens c1s were racing hard with Rod Clark just taking out the yellow jersey. Stage 2 was from Trawool Bridge to Goulburn Park Seymour (17km) with some hard racing by James Miller resulting in Rod just hanging onto the jersey. Fastest time for this stage as Hamish Young(k1) in a impressive 1 hour 10 min 50 seconds. This was followed by a lunch break, awarding the yellow jersey and spot prizes. The final Stage 3 was an individual 6km Time Trial from Caravan Park to Lyons Park Seymour with the slowest boats off first with 30 second intervals. All the classic paddlers were pretty tired by now but we did have some fresh paddlers just doing the 6km timetrial. So it came down to the final 6km timetrial to sort out the yellow jersey and the eventful victor. John Young and Dominic Scarfe put down a blistering 6km of 21 min 28 seconds but it wasn’t enough, with Bec Mann hanging on to clearly win stage 3 yellow jerseys and the overall Goulburn Classic. Fastest boat was Hamish Young, fastest was John Young and Dominic Scarfe in a K2, C and Karly Verbeek & Ashley Bell were the fastest canoe paddling a TC2 by a slender margin. We had a few swimmers and paddlers who just completed the early stages , and finishing up with good numbers in the community FUN paddle at the end. We had plenty of spot prizes and special thanks go to Canoes Plus, Wes Hurry (E2A) and the Bendigo Parents who put on the free morning tea and assisted in running the event. 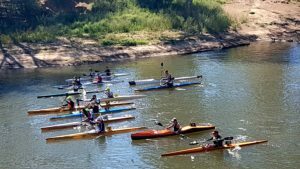 A few years ago , our goal was to bring back some great river races to make up an informal south eastern series with other events ( eg the mini, Albury , Upper Murray) and the next event we will be running is the E2A river race on Sunday 24 March 2019. The e2a Classic River Race is a 34km river race from Eildon to Alexandra, Victoria on Sunday, 24 March 2018. This is a two stage with the option to complete just one stage or both. Stage 1 is a 14km paddle from below the gates at Eildon to Thornton starting at 10am. After a short break, stage 2 starts at midday and covers 20km from Thornton to Alexandra, finishing at the boat ramp by the Maroondah Highway Bridge over the Goulburn River. The event is perfect for kayaks, skis and canoes, and covers a beautiful and scenic section of the Goulburn River. Stage 2: 20km t2a is ideal for all craft.